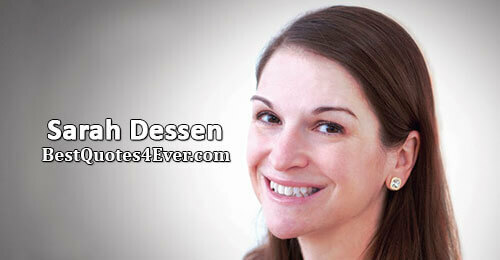 Sarah Dessen is an established contemporary American writer. Born on June 6, 1970, she grew up in Evanston, Illinois. She is famous for writing realistic fiction under young adult literature genre. Love is needing someone. 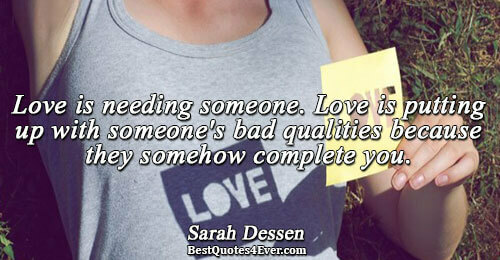 Love is putting up with someone's bad qualities because they somehow complete you. 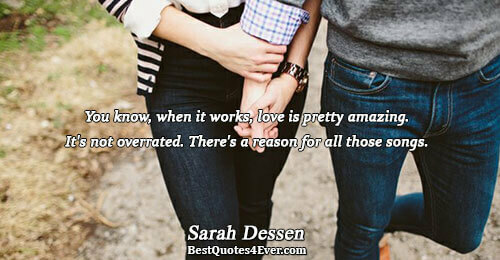 You know, when it works, love is pretty amazing. It's not overrated. There's a reason for all those songs. If you didn't love him, this never would have happened. But you did. And accepting that love and everything that followed it is part of letting it go. It didn't make you noble to step away from something that wasn't working, even if you thought you were the reason for the malfunction. Especially then. It just made you a quitter. Because if you were the problem, chances were you could also be the solution. The only way to find out was to take another shot. That was the thing. You never got used to it, the idea of someone being gone. Just when you think it's reconciled, accepted, someone points it out to you, and it just hits you all over again, that shocking. It's all in the view. That's what I mean about forever, too. For any one of us our forever could end in an hour, or a hundred years from now. You never know for sure, so you'd better make every second count. Maybe the truth was, it shouldn't be so easy to be amazing. Then everything would be. It's the things you fight for and struggle with before earning that have the greatest worth. When something's difficult to come by, you'll do that much more to make sure it's even harder-if not impossible-to lose. 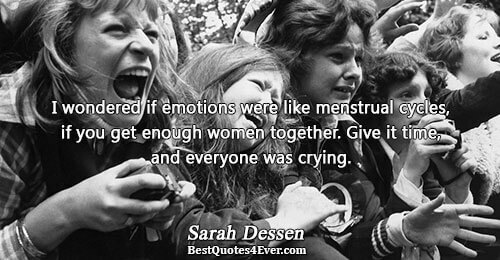 I wondered if emotions were like menstrual cycles, if you get enough women together. Give it time, and everyone was crying. 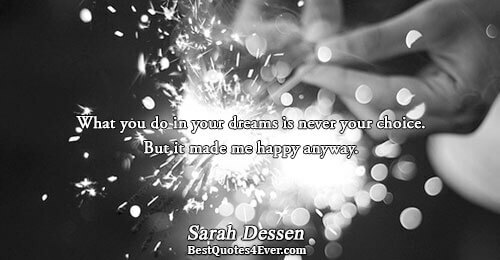 What you do in your dreams is never your choice. But it made me happy anyway. That was the hard thing about grief, and the grieving. They spoke another language, and the words we knew always fell short of what we wanted them to say. There was something really great about being able to put something out into the world - a song, an introduction, even my voice - and let people make of it what they wanted. I didn't have to worry about how I looked, or if the image of me people had fit who I really was. I mean, it's not surprising, really. Once you love something, you always love it in some way. You have to. It's, like, part of you for good. 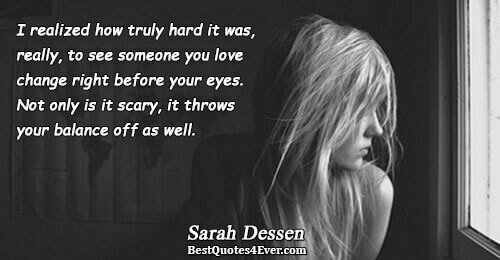 I realized how truly hard it was, really, to see someone you love change right before your eyes. Not only is it scary, it throws your balance off as well. 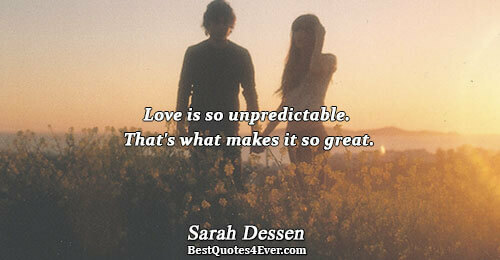 Love is so unpredictable. That's what makes it so great. You asked me to go out with you. I know you probably changed your mind. But you should know, the answer was yes. It's always been yes when it comes to you. Are those the only options? 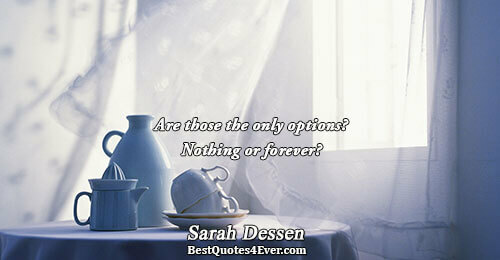 Nothing or forever? You want to take me to a movie?" I asked. "Well, not really," he said. "What I really want is for you to be my girlfriend. But I thought saying that might scare you off.